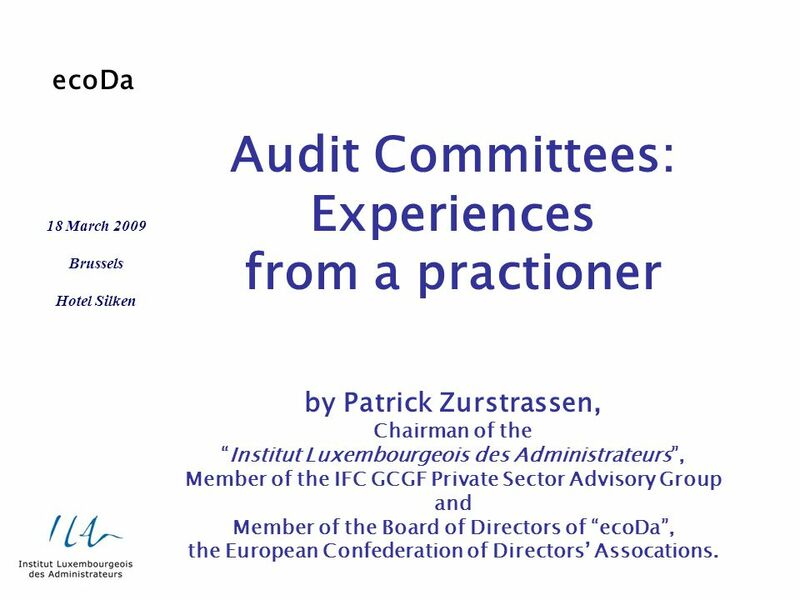 Audit Committees: Experiences from a practioner by Patrick Zurstrassen, Chairman of the “Institut Luxembourgeois des Administrateurs”, Member of the IFC. 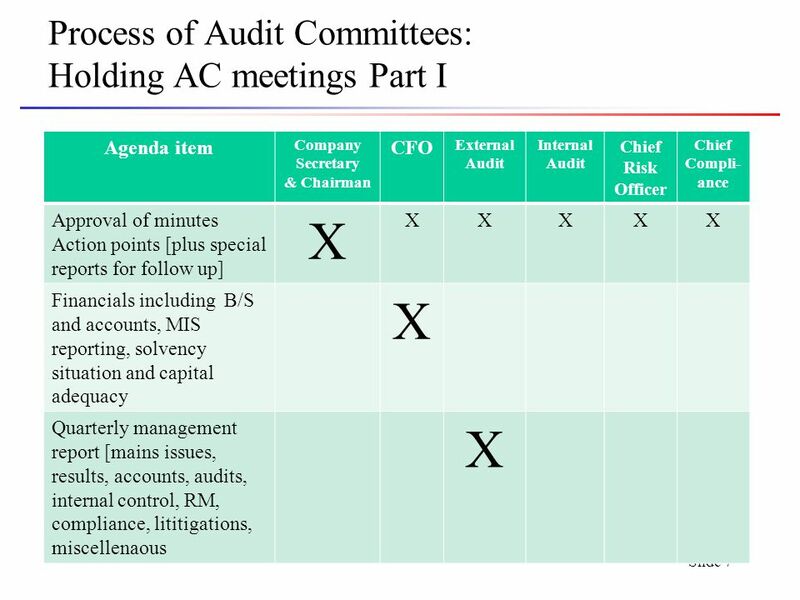 2 Slide 2 Origins of Audit Committees: Not all created because of 8th Directive Transformation of audit review committee into full-fledged AC. Some A-to-Z spontaneous moves Compliance with listed companies code of conducts adopted within the frame of the EC Corporate Governance Bolkenstein Plan [see national code of governance] Percolation of listed head companies AC practices down to major affiliates, especially if public interest companies [listed companies, banks, insurance and investment companies]. 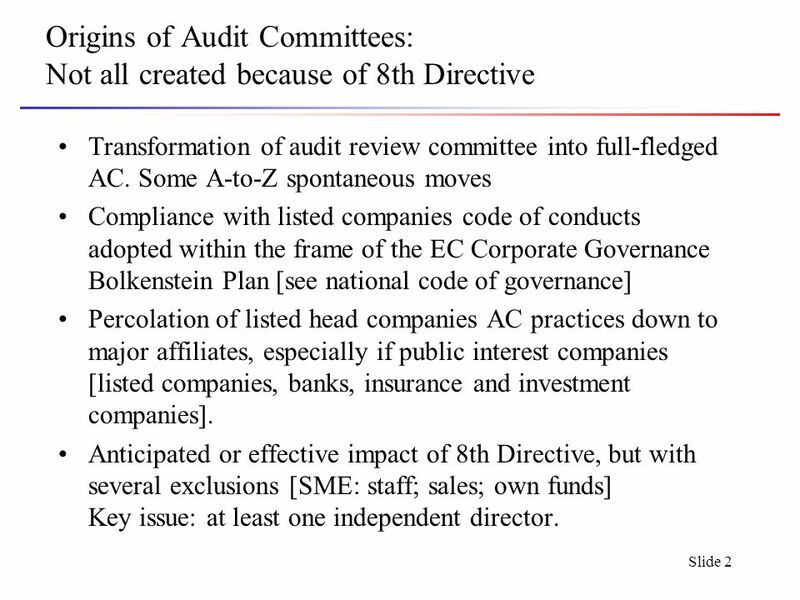 Anticipated or effective impact of 8th Directive, but with several exclusions [SME: staff; sales; own funds] Key issue: at least one independent director. 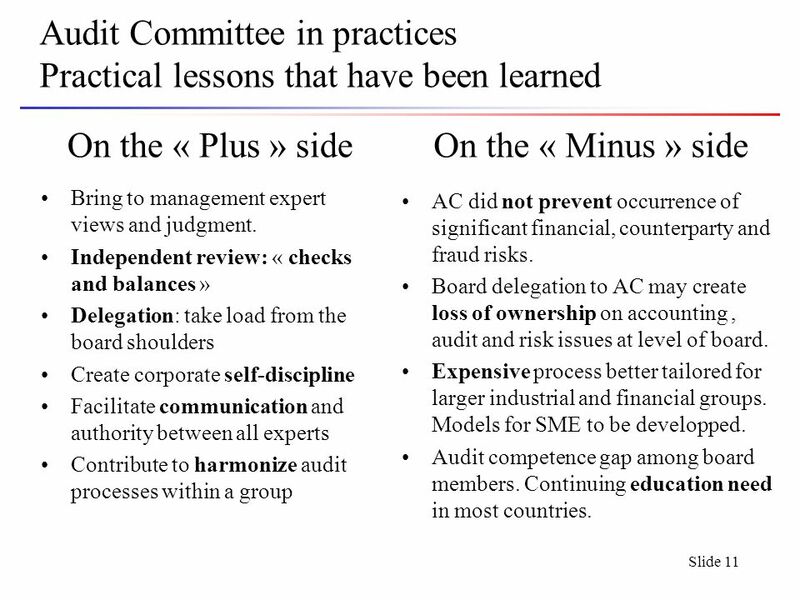 11 Slide 11 Audit Committee in practices Practical lessons that have been learned On the « Plus » side Bring to management expert views and judgment. 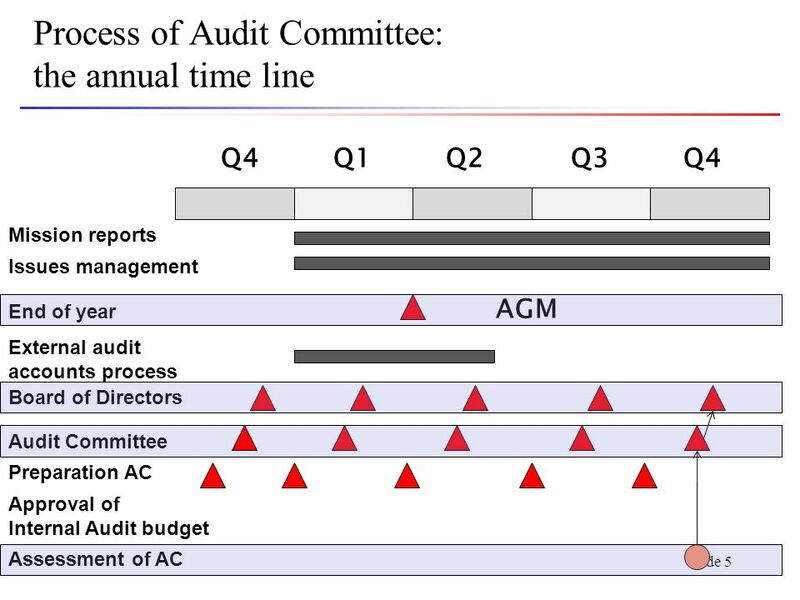 Independent review: « checks and balances » Delegation: take load from the board shoulders Create corporate self-discipline Facilitate communication and authority between all experts Contribute to harmonize audit processes within a group On the « Minus » side AC did not prevent occurrence of significant financial, counterparty and fraud risks. 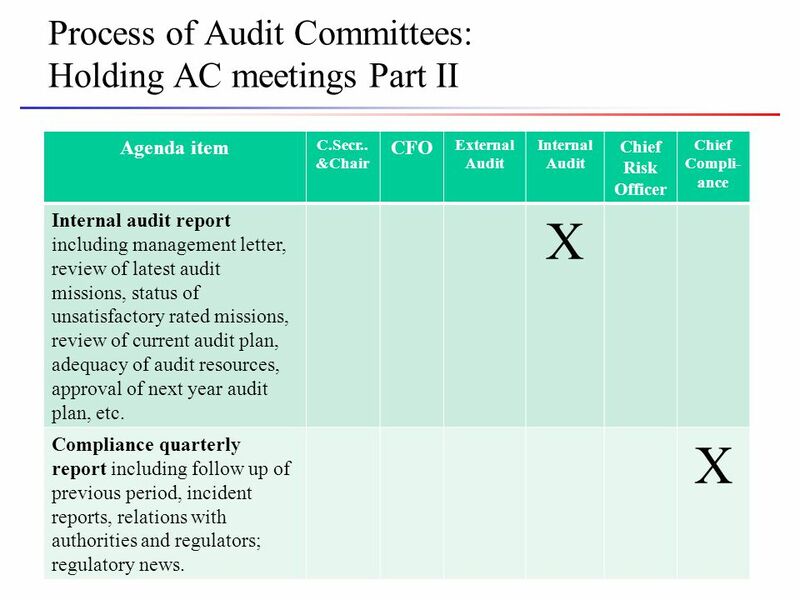 Board delegation to AC may create loss of ownership on accounting, audit and risk issues at level of board. Expensive process better tailored for larger industrial and financial groups. Models for SME to be developped. 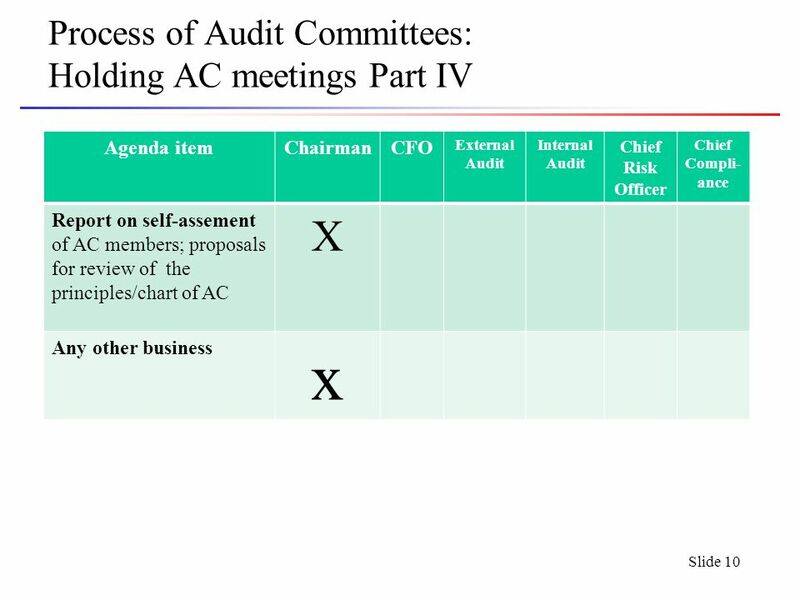 Audit competence gap among board members. Continuing education need in most countries. 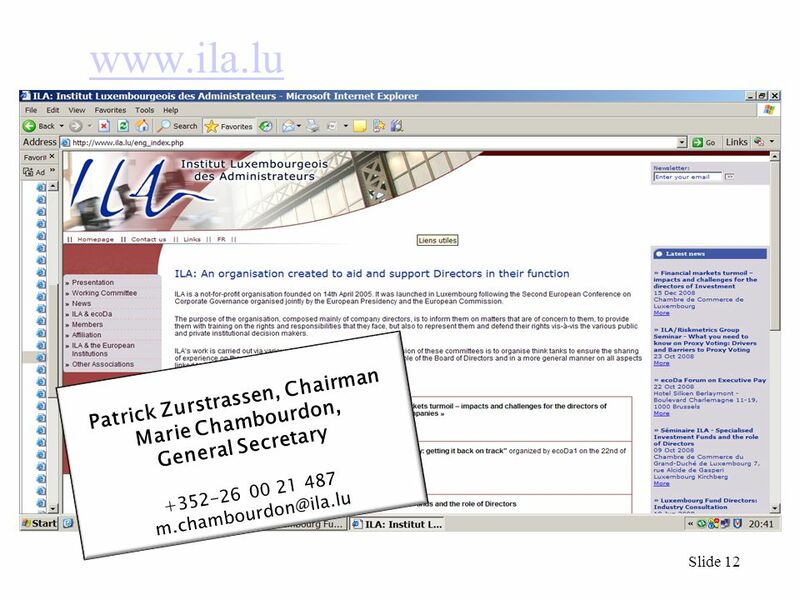 Download ppt "Audit Committees: Experiences from a practioner by Patrick Zurstrassen, Chairman of the “Institut Luxembourgeois des Administrateurs”, Member of the IFC." 1 National Police Board 16 September 2009 Elisabeth Styf President ECIIA Chief Audit Executive for the Swedish Police Service 21 police authorities, the. BOARD EFFICIENCY: The Agenda Setting Role and Information Needs of the Supervisory Board Holly J. Gregory Weil, Gotshal & Manges LLP. KING III Impact on Government. Contents Introduction Key Principles of King III Governance Framework and Application New Requirements Chapters 1 to 11. Radmila Trkulja, Head of the CHU of Republika Srpska. Process of CG in Egypt Mohamed Omran Vice Chairman Cairo & Alexandria Stock Exchanges December, 13 th 2006. Palestine Capital Markets Authority1.  PCMA has been established in 2005 to be the REGULATOR for the non- banking financial sectors  Sectors under the. 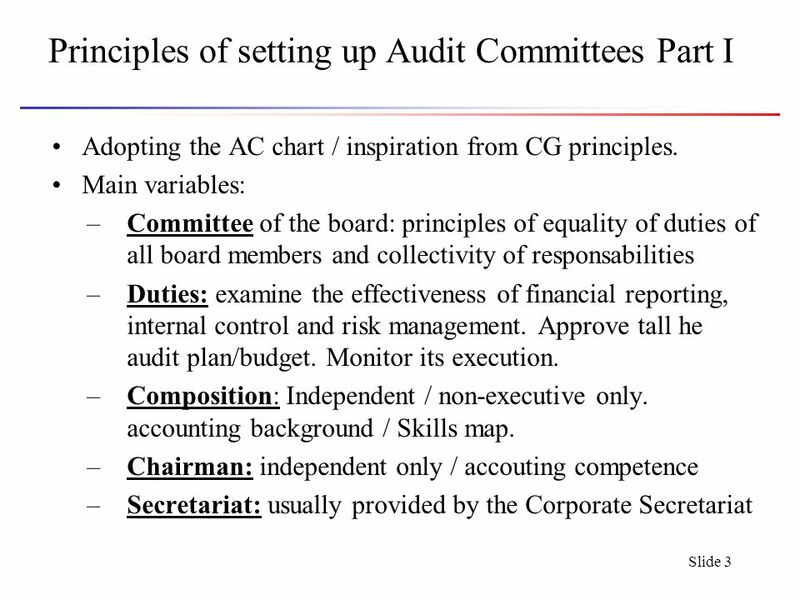 Audit Committee in Albania Legal framework Law 9226 /2006 “On banks in Republic of Albania” Law 9901/2008 “On entrepreneurs and commercial companies” Corporate. 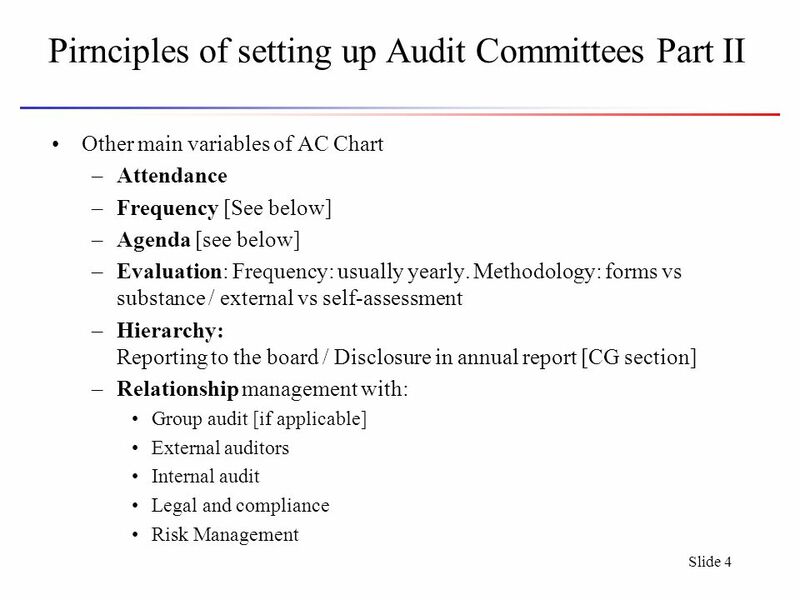 NAIC Oversight of Corporate Governance Commissioner Susan Donegan Vermont Department of Financial Regulation. 1 PRACTISING CORPORATE GOVERNANCE IN HONG KONG Speech to American Chamber of Commerce in Hong Kong, 12 December 2003 By Paul M Y Chow, Chief Executive. 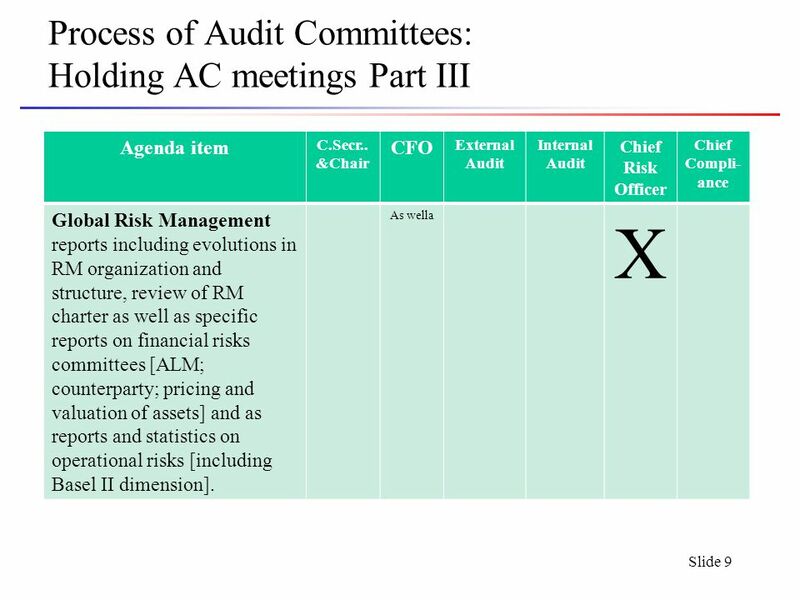 The Role and Value of Internal Audit Association of Credit Union Internal Auditors September 26, 2012. The Trade Finance Bank for Africa An overview of Afreximbank’s Approach to Corporate Governance Issues Presentation by Mr. George ELOMBI Executive Secretary. 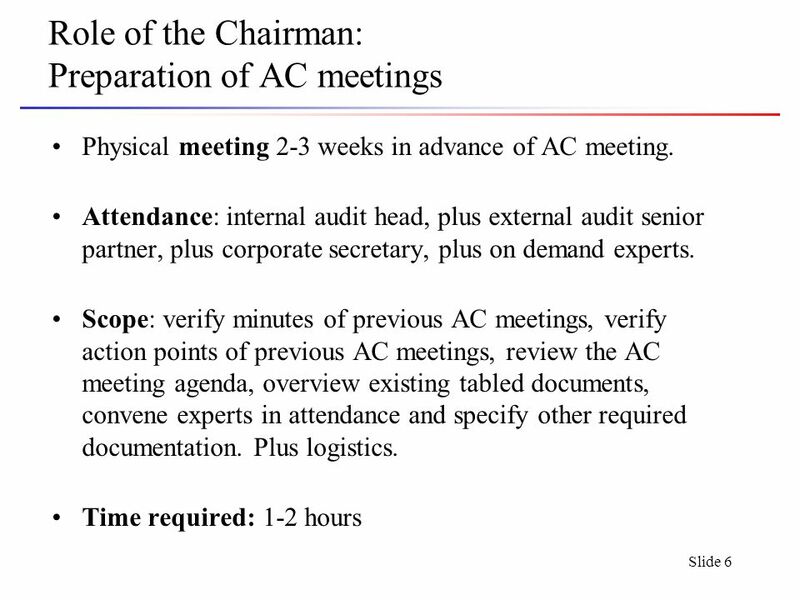 Audit Committee Roles & Responsibilities Audit Committee July 20, 2004.